When not in use, the selfie stick conveniently folds up, allowing you to easily store and transport it - and when you do want to use it, it couldn't be easier to set it up again! 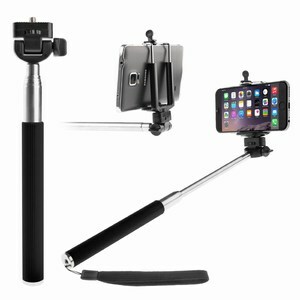 Best of all, the selfie stick comes equipped with a universal adaptor, making it suitable for use with both digital cameras and GoPro personal cameras, ensuring maximum versatility when it comes to taking your pictures! So if you want to take the best photographs you can of both you and your friends, there's no contest - only the fantastic selfie stick will do!